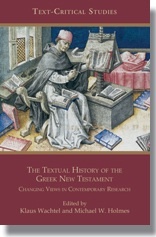 The Textual History of the Greek New Testament: Changing Views in Contemporary Research edited by Klaus Wachtel and Michael W. Holmes. This collection of essays by respected scholars represents the state of the art of textual criticism as applied to the New Testament. Addressing core topics such as the causes and forms of variation, contamination and coherence, and the goals and the canons of textual criticism, it presents a first-class overview of traditional and innovative methodologies as they are applied to reconstructing the initial wording of the New Testament writings. In this context, the new Coherence-Based Genealogical Method (CBGM) is introduced and discussed extensively. Integrating established approaches and procedures, the CBGM features a new category of external evidence: genealogical coherence of witnesses. Klaus Wachtel is Research Associate, Institut für Neutestamentliche Textforschung at Münster University. He is co-editor of Novum Testamentum Graecum, Editio Critica Maior. Michael W. Holmes is University Professor of Biblical Studies and Early Christianity at Bethel University. He is editor of The Greek New Testament: SBL Edition. The volume front matter, including the table of contents and introduction is available here.